Make your next vacation an Orlando Vacation! Orlando is famous for being the theme park capital of America, a title that is well-deserved. Orlando and the surrounding areas have major international parks, smaller attractions, and an incredible family-entertainment orientation. Orlando is the place every kid dreams of visiting, and it has something for everyone in the family to enjoy. “Zippy Doo Dah, Zippy Ay, My Oh My What A Wonderful Day”!!! And what a wonderful day (or week or two) for anyone visiting this magical place. If you are one of the lucky millions of people who will visit this fabulous “world”, get ready to have the ride of your life. It has been said that if you were to visit every attraction in the area, by the time you finished, a new one would have been built. What many visitors think of as Orlando, is actually Lake Buena Vista, the Orlando suburb that lies at the heart of Disney World. Visitors from around the globe flock to this destination to experience the magic that is Disney in the form of Animal Kingdom, Fort Wilderness, Epcot, MGM Studios, Camp Disney, and the park that started it all: the Magic Kingdom. Additionally there is Universal Studios, Sea World, Downtown Disney, three water parks, Pleasure Island, five championship golf courses, Disney’s Wide World of Sports complex, a racetrack and restaurants to satisfy anyone’s taste, and several more themed areas including a new live animal safari zone. Rides, rides, and more rides abound in Orlando, and they are constantly being updated and improved. All of these wonders have become synonymous with Orlando, and, indeed, have made the young city of Orlando the world’s most popular vacation spot. The area enjoys year round mild weather. There are no “snow days”!!!. If you are trying to avoid the crowds, the period from the Sunday after Thanksgiving until the week before Christmas tends to be the least crowded. Christmas and spring vacations, and of course, summer, when school is out, are all popular seasons for the Lake Buena Vista/ Orlando area. Summer can be very warm and humid. Shorts are acceptable wear at all of the major attractions and at most restaurants. Summer is also the perfect time to enjoy one of the numerous water theme parks in the area. Jump in and cool off, the water’s fine! Orlando itself is a city of great beauty. Summer rains and the warm climate produce lush vegetation. Palm trees, pines, and oaks draped with Spanish moss provide nature’s decoration. Brick-paved streets add a gracious touch. Landscaped gardens display a profusion of flowers and exotic plants. 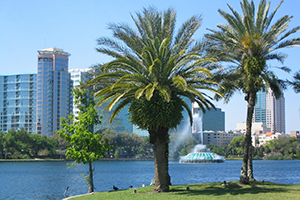 Orlando is in the midst of central Florida’s lake country and is surrounded by numerous parks offering hiking, biking, and water sports. Outdoor living is great for the whole family, but be sure to bring plenty of sunscreen for those sunny Florida days. Orlando Museum of Art, Orlando Science Center, Flying Tigers Warbird Restoration Museum, and Albin Polasek Museum and Sculpture Garden are just a few of the outstanding local cultural attractions. The nationally recognized Orlando-UCF Shakespeare Festival, the Orlando Opera Company, Orlando Philharmonic, and the Southern Ballet Theatre are just a few of the seasonal favorites. Numerous other attractions are within an easy drive of Orlando, including the Disney World Resort, Sea World, Wet ‘n Wild, Universal Studios, Orlando Speedworld Speedway, and others. Dinner theaters provide a unique form of entertainment. There are a variety of venues including a Pirate adventure, Medieval Times, Arabian Nights, (complete with horses), a Dixie Stampede, and even a Sleuths’ Mystery. What a great way to relax and unwind after an invigorating day at the parks. Shopping in the Orlando area has as much variety as the local attractions. Souvenirs and mementos for the family and for friends back home are easy to find. Outlet centers and factory stores abound and offer some of the best bargains in town for everything from shoes and clothing to household appliances and fine china. Shopping areas in Orlando and Kissimmee are popular for their fun environments, such as the Disney Village Market Place and Old Town in Kissimmee. 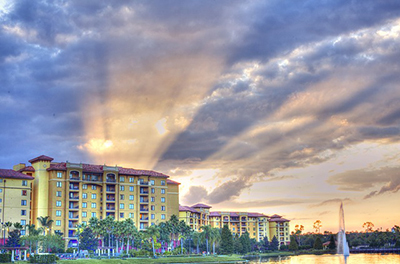 Whatever brings you to the area, whether business or leisure, Orlando provides an unforgettable setting. At every Disney attraction, there is an opportunity to see the world through a child’s eyes. That look of amazement each and every time a Disney character makes an appearance or a child takes that exciting ride for their first time, is an experience to remember and to cherish. The wonders of Orlando, Lake Buena Vista, and Kissimmee are magical, and in these enchanting places, everyone gets to be young and carefree. Experience Japan, China, France, Britain, Mexico, and Italy without leaving the country. Epcot provides a thrilling day of fun and hands-on discoveries. A spectacular dinner entertainment complex featuring a unique skew-style feast, dazzling performances, pira-technics, and amazing stunts. Includes the live water adventure, Baywatch at Sea World; the polar expedition, Wild Arctic, the Shamu: Close Up! killer whale breeding, research and observation facility; and other attractions and shows. Orlando also features other types of enjoyment. Yep. It’s hard to believe, but even Mickey needs stylish garb, nouveau cuisine, and a place to chill when he’s done for the day. What comes to mind when you think of Orlando? Loud children chasing a man in a mouse suit (who was probably out till 3am the night before)? Not so anymore. Orlando offers every conceivable type of food and lodging. From the most swanky hotels that cater to international business types, to moderate priced family centered hotels, to motels, to camping, to lodges, there are accommodations for everyone! Search hotels in Orlando on trivago! World class golf courses, tennis clinics, spas, resorts, and more await visitors who aren’t terribly interested in theme parks. Orlando also features dozens of smaller attractions, and an enviable nightlife. Each of the theme parks and attractions will tempt you to enjoy their night time entertainment, but the local restaurants and clubs offer just as much fun without the theme park cost. Orlando is home to hundreds of restaurants of every type, not counting those inside the theme parks. Orlando’s visitors are international, so it caters to all tastes. Orlando has been hosting millions of visitors a year for decades, so it has lots of experience in how to treat guests and make them feel welcome. Hospitality is not just the industry behind the entire Orlando way of life, it is the Orlando way of life! From the biggest theme parks in the world and some of the best hotels, to the smaller attractions and some of the best values, Orlando is a city for everyone, especially families! Finding a good deal on a flight to Orlando shouldn’t be too much of a hassle for you if you’ll take the time and patience to explore the many different ways to research your options. With a little effort and research, you should be able to find several good deals to choose from. You should check directly with the airlines that provide flights to Orlando from your home city (or a city near you) to see if they are offering any special deals. You can oftentimes find drastically reduced price tickets to Orlando for a limited number of seats and for a limited time. Prices for flights seem to be changing all the time so it’s also important to check back often to see if you can find a better price. You’ll also want to check the travel section of your local newspaper to learn about any package deals being offered to Orlando. You can oftentimes save a bundle on both the airfare and hotel when you book them both together as part of a package. There are many ways to get the best deal on hotel accommodations in Orlando, whether just for you for a night or two, or for a fun-filled week of family adventure. Explore some of the accommodations available for you on this site.